The end result I’m now calling the Mini-Widget II, and it’s aimed at those surfers who enjoy the fast planing, skatey feel of the mini-Simmons style grovel board, but want to surf more vertically, especially as wave conditions improve. 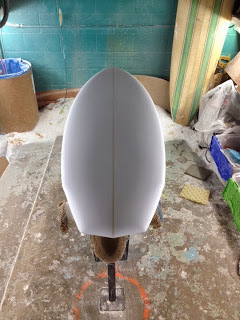 This board will be fitted with 5 FCS boxes to provide plenty of fin options. Got a shape you want in mind? Send me a text, email, or give me a call and lets get started!